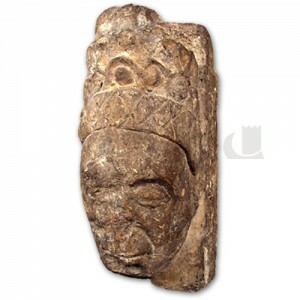 This sculptured stone head was found on the site of the old Rectory House in Fisher Street, Swansea, it dates from approximately 1330. It is thought to have come from St. Mary’s Church, Swansea where it may have been a mullion, in Gothic architecture, a vertical bar dividing the lights in a window. It is believed to represent Alina de Mowbray, the eldest daughter of William de Braose, Lord of Gower. When Alina’s brother, William, died in 1318, her father bestowed the Lordship of Gower on Alina and her husband, John de Mowbray. However, in a bid to make money, it seems he made the same promise to a number of other people who then challenged Alina and John. The King, Edward II, intervened in the ensuing dispute and several people were executed including John de Mowbray. In 1327, Alina regained the Lordship of Gower but when she married for the second time in 1328 to Richard de Pershall, she and her new husband did not prove popular with the people of Gower. When Alina died in 1331 the title went to her son by her first marriage, also named John de Mowbray. However he failed to maintain the family’s close connection with the Gower, pursuing his extensive business interests in England rather than retaining Swansea as his main residence. Alina had strong connections with Oystermouth Castle – visit www.swansea.gov.uk/oystermouthcastle to find out more about conservation work and events at the castle.